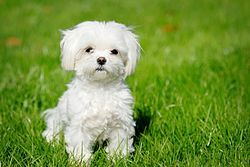 The Maltese is alleged to go back, as a breed, for a thousand years. Certainly the existence of small, white, long-haired dogs of the Maltese type, as the pampered pets of wealthy women, is attested in the iconography, not only paintings but even tapestries. Clearly the ownership of such a dog was a status symbol, just as certain breeds today can become fashionable for a time, then be replaced by the latest fad, often these days by some new cross-breed (never to be called mongrels!). These little white dogs were pampered pets, sleeping on embroidered cushions or the owner’s bed, and frequently shown wearing velvet collars adorned with bells. When the dog died, it would be mourned as deeply as any modern pet, and many were given marble monuments. Poets and friends of the bereaved owner would write elegies or appropriate epitaphs for the tomb. For the owner it meant the loss of a beloved daily companion. But was it only women who owned such dogs? For their male counterparts, who spent much of their life outdoors, there were also animal companions, but they tended to be different. Favourite dogs were hunting dogs, who might be trackers, retrievers, or killers. Their descendants are still with us today in the various retrieving breeds, including spaniels, tracking dogs like fox hounds, or the hunting breeds like wolf hounds and boar hounds. These male-owned dogs did not share their owners’ homes, but lived in kennels, and their collars were practical and serviceable, sometimes adorned with spikes to protect their throats in a fight. Men of the nobility also owned favourite horses, who clearly could not be pets, but lived in stables, and various types of birds of prey, who were kept in mews, although they are sometimes pictured indoors, where a favourite hawk might be seen perched on a special stand. Another group of men did keep indoor pet dogs: clergy and scholars (many of the latter also being in holy orders). Like the wealthy ladies, they tended to favour the small white dogs, quiet companions often shown curled up at the owner’s feet while he studies or writes. Sometimes there might also be another, bigger dog, more of a watch dog. Petrarch favoured large dogs and even wrote about them in surviving letters. Dogs, of course, were not the only pets. 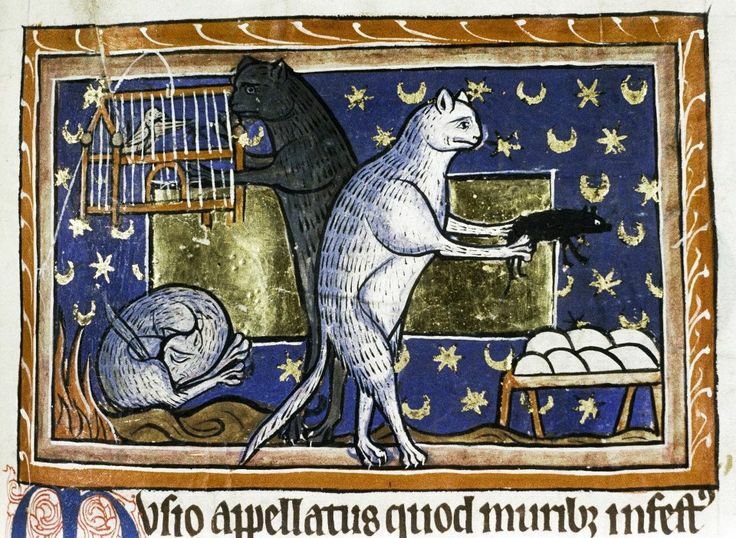 Cats were not merely companions but served a useful purpose too, since they kept down mice and rats in the home, a laudable occupation as commemorated in the ninth century Irish poem Pangur Ban by an anonymous scholar. The moralists who condemned pet dogs seem to have been more tolerant of cats, who were probably less spoiled and less expensive to keep. They also seem to have been much more difficult for contemporary artists to depict! The typical native British cat was grey with black stripes, probably still the commonest form of moggy to this day. Our own rescue kitten is of this type. However, from the fourteenth century a type of Syrian cat began to be imported into Britain. They were a tawny brown with black stripes, a tabby colouring, and these exotic animals were much coveted, selling for high prices. Merchants would buy them and import them, often via Greece, Cyprus, and Italy, and if they survived the journey they would become the latest fashion accessory for the wealthy. Another small mammal which often occurred as a lady’s pet – and unfamiliar today – was the squirrel. These are generally depicted with a collar and lead, presumably because they were apt to run away. They were, of course, red squirrels, the invasive American greys not yet having reached Europe. One can be seen in the arms of the woman at the front of the carriage below, while the woman at the back is being handed a small white dog. The ladies were off on their travels, taking their pets with them. 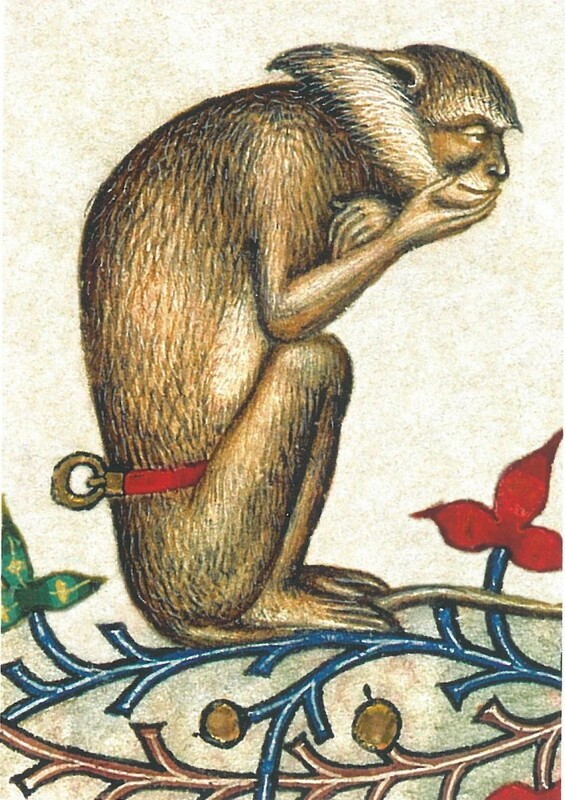 The only other type of animal which was regularly kept as an indoor pet was the monkey. Some ladies loved the creatures, despite their destructive habits, dressing them in little coats and treating them like substitute children. However, they were most popular amongst the higher clergy, who sometimes kept more than one and lavished rich food and affection on them, a practice which was roundly condemned as improper and immoral. 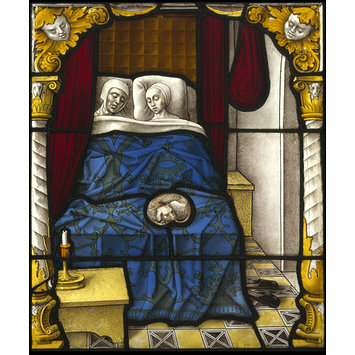 These abbots and bishops, like their secular counterparts, also kept horses, hunting dogs, and hawks. 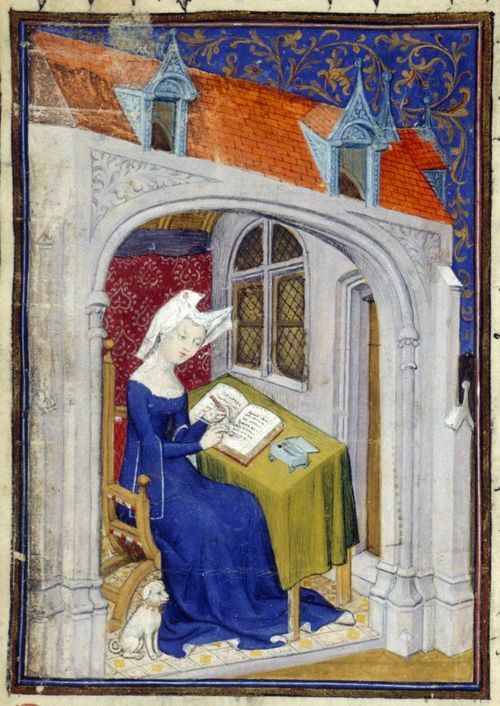 Chaucer has much to say (and mock) on the subject, as indeed he mocks the Prioress with her dogs. Birds were the last of the main types of pet. These were often singing birds, our common garden songsters. Sparrows were popular, and had been ever since Catullus wrote two poems lamenting the death of his mistress Lesbia’s pet bird back in Roman times. These birds frequently had elaborate cages, some even of gold and studded with jewels. There was no limit to the ostentatious bling for such pets. What can surprise us is the number of parrots which were kept. A parrot sounds like a very exotic pet for the Middle Ages, yet they seem to have been fairly common. These were Indian parrots, the green rose-ringed parakeet, and they appear in the margins of manuscripts, form the subject of large illustrations, and occur in portraits of their owners. Moreover, being more talkative than cats and dogs, they spawned a whole literature of their own. They had a tendency to narrate satirical poems and stories, all the way from Scotland to Spain. Pets in the wrong place could raise hackles. Nuns had a habit of taking their little dogs (and rabbits) into divine service with them. Repeated injunctions failed to eliminate the practice altogether, though keeping pets in nunneries was tolerated as long as they were not taken into church. 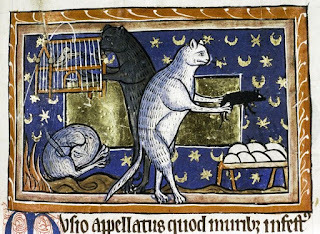 So many animals were kept in monasteries that it aroused the wrath of the authorities, but once again it had little effect. The other institutions which tried to clamp down on the keeping of pets were the universities. Again and again Oxford and Cambridge issued regulations banning the keeping of pets by students. These boys came up to university at a very young age, some as young as twelve, and one can have some sympathy for a homesick boy wanting the companionship of a favourite dog. However, as many students came from the landed gentry, they also liked to bring their horses, hawks, and hunting dogs. The university bans grew ever more desperate, excluding dogs, birds, monkeys, deer, ferrets, badgers, foxes, wolves, and bears. Bears?? As far as I know, these regulations are still in existence and more successfully enforced, though when I was at Oxford there was a student who kept a pet python. He used to come to parties with it draped round his neck . . . 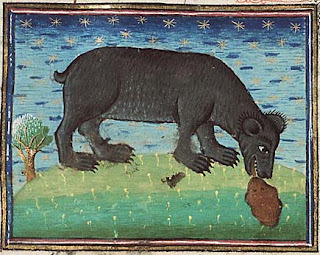 So, if you had lived in the Middle Ages, which kind of pet would you have chosen? Enjoyed the post! One of my dogs would fit right into the Middle Ages because he's a terrier called Jack - both type and name are recorded in the Middle Ages on tombs. One 'Terri' is noted on a lady's tomb and on a man's there is a 'Jakke' Have you read the Kathleen Walker-Meikle book 'Medieval Pets'? It's a terrific resource. As the local mad cat lady I would have to bring my cats, my one fear is cars that drive too fast so being int he middle ages my cats would be much safer and probably even more annoying to my neighbours :-) Being four girls and all related they tend to pack hunt and bring down fairly large birds and any small mammal! I may have found myself in trouble if they brought down other folks stock! I worry about tame rabbits as they bring home wild ones now. sadly they tend to bring me the heads and not the meat for any pots but they probably wouldn't need feeding much. Then as now, dogs and cats were the preferred pets. Terriers could be ratters as well as pampered pets, so they could find their way into the homes of ordinary people, not just the aristocracy, and would have been useful on farms and peasant small-holdings. Cats hunting in packs would have earned a useful place in any household plagued by rats or mice, and certainly would be safe from modern cars. There was plenty of traffic then, of course, but I reckon any cat worth its salt could get out of the way of horse-drawn or ox-drawn vehicles. I've always been intrigued by pet sparrows, ever since reading Catullus's poems when working for A Level Latin. Considering the frequency with which they are mentioned, they must be fairly easy to tame. Our garden sparrows always sem to be very cheery little souls. Loved this post, Ann. It is a lovely insight into life in the Middle Ages, and is a much needed anecdote to the usual descriptions of Age as brutal and cruel. Loved this post. 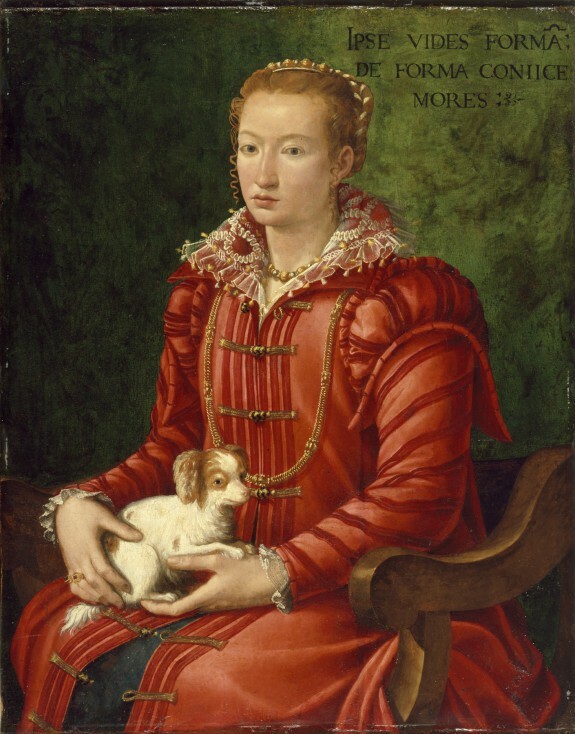 I also love the painting (can't remember the artist) of the lady in ermine from this period holding the ferret. Speaking for myself, I would like to have a big goldfish in somewhat an aquarium. And from among these, I'd say a dog is a man's best friend. Those principles additionally endeavored to twist up a better than average way to deal with see that different people online have the indistinct power like mine to handle wonderful plan more around this condition. 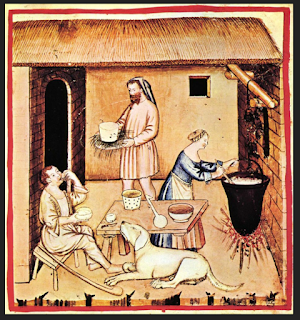 One thing to consider is that pets in middle ages didn't have access to the same type of care. This quite clearly made many people have their expectations tempered throughout their lives.